President Barack Obama waves to supporters in Chicago after winning a second term. Photo by Jim Bourg/Reuters. Follow Election Day activities, starting at 7 a.m. ET Tuesday, in our live blog. We’ll have on-the-ground reports from our local PBS stations, results as they roll in, and analysis from a cast of NewsHour guests. 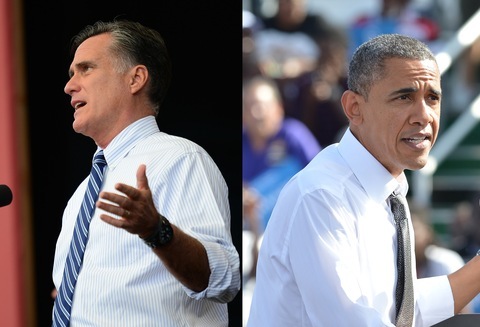 On Wednesday, watch this space for reaction to results, beginning again at 7 a.m.
Mitt Romney and President Obama at campaign events. Photo by Vallery Jean/FilmMagic.